It is an approximate 3 mile round trip from the parking lot to the base of the falls. The climb to the top will add a vertical, three quarters of a mile, at minimum. The trail crosses large sections of naked granite, making it easy to lose track of the trail. During the summer, when the area is well-traveled, the hike to the base of the waterfalls is a moderate hike. Those who continue forward following cairns up the left side of the waterfall are in for a ton of rock scrambling and a challenging climb. Peak season is late spring/early summer when much of the snow has melted away from the sloping walls of the u-shaped canyon, leaving the falls full and trails accessible. Dogs are allowed on the trail with a leash. However, we strongly recommend leaving your pup at home if you intend to get near the falls or hike to the top. The climb is intense and dangerous for dogs. On one trip, we saw a dog lose their footing on the slippery rocks and fall into the falls. This is not something you forget easily, and as a result, we leave our trail dogs at home. Parking is limited and requires a $5.00, self-registered parking permit. There are pit and flush toilets at the trailhead. Day hikes into Desolation Wilderness require a self-registered wilderness permit, available by the information sign at the trailhead. The trail to Horsetail Falls follows along the west side of Pyramid Creek. The waters are fed by snowmelt from surrounding peaks in Desolation Wilderness, named aptly for its wide open views of exposed granite, twisted trees, and full sun exposure. The trail to Horsetail Falls is well-trodden during the summer months with visitors hiking to and sharing lunch at the base of the falls. However, if you are up for the challenge, we recommend the haul to the top of the falls. Calculated at a 42% grade and climbing nearly 800 feet in less than a half mile, the scramble will certainly pump out some adrenaline. 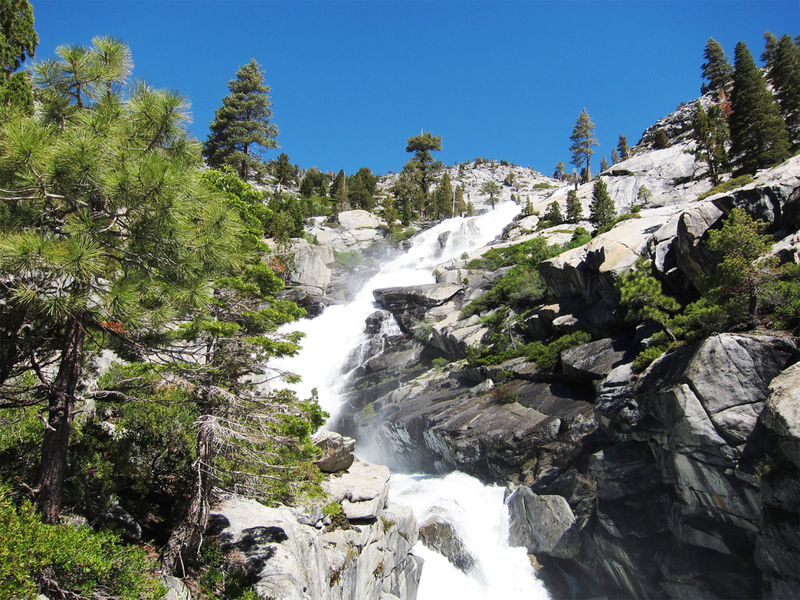 Located in Twin Bridges, the trailhead for Horsetail Falls begins high in the Tahoe mountains. The initial mile and a half is a moderate hike, traversing around massive granite boulders and weaving in and out of dense pine forests. Sections of the trail cross large expanses of granite, and in late spring, when there is still snow on the ground, it is easy to lose track of the trail. Using Pyramid Creek as your compass, stay to the left and you are bound to meet back up with the path. Along Pyramid Creek there are several swimming holes and cascades to discover. Be sure to load up on water and have a water filtration system with you, because in many sections, you are at the full mercy of the sun. The granite beneath your feet acts as an oven, absorbing the heat, and throwing it back up to your face. It is crucial to be—and to stay—hydrated as you climb the falls. The climb up the left side of Horsetail Falls is a full body, daring effort in bouldering and rock scrambling. A spectacular view of the U-shaped canyon, scraped into being by ancient glaciers, is your reward for muscling your way to the top. Cairns and a few spray painted rocks sometimes mark the best approach. Yet, these are not always reliable; be sure to listen to your gut instinct. People are injured every year attempting to climb up the massive rock slabs; if you don’t feel comfortable, turn back. Scrambling down is often more nerve-wracking than the way up. Those casually flirting with the outdoors will love the hike to the base of the falls. It gives you a pleasant, bite-sized taste of Desolation Wilderness with a satisfying destination. To the outdoor over-achiever—you know who you are—you will love the challenge of powering up to the crown of the boisterous falls. The parking lot for Horsetail falls is off of Interstate 50 in Twin Bridges. There is a self-registered parking fee of $5 and you’ll want to get there early as the parking lot is known to fill up later in the day. Day hikes into Desolation Wilderness require a self-registered wilderness permit. Permits are typically provided near the information sign at the trailhead; have a pen nearby in case the pencils have wandered off. One per party is all that is required, however, stay together as your permit must be with you at all times. Written by Rashael Parker for RootsRated.